Since my farmer’s market haul for the week included not only a bagful of sprightly red and yellow heirloom tomatoes but two round eggplants, and since I was just thinking fondly of the Greek festival put on in Portland around this time every year, I decided it was time to try my hand at moussaka. This turned out to be quite a project, much like making lasagne, but also like lasagne, the end result was totally worth the investment of time and effort, and we will be eating the leftovers for days to come. The first steps in making moussaka are to slice and salt the eggplant, so that it can spend at least 45 minutes draining, and then to make a meat sauce with ground lamb or beef. I used the latter, freshly ground from an enormous round tip roast. 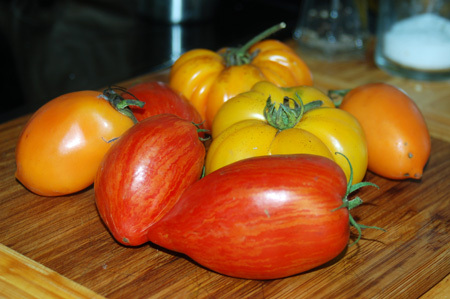 I also peeled, seeded and chopped some striking heirloom tomatoes that looked like stripey Romas—I think they may have been called something like Marvel Stripes. The sauce was finished off with plenty of onion and garlic, a pinch of allspice and a 1″ piece of cinnamon stick; red wine and tomato paste were added in near the end of the cooking time. The completed meat sauce was thick and so richly perfumed with cinnamon that I was actually a little worried about it. I had planned to broil the eggplant slices, but the tomato skins were still dehydrating in the oven (for more tomato powder, and yes, I really do need to get an actual dehydrator! ), so I went with the more traditional pan-frying route. I also sliced and sauteed a few potatoes, since I was concerned that I wouldn’t have a sufficient amount of eggplant; potatoes are often included in moussaka, so this was not a stretch. The last step was layering everything up and topping it off with an egg yolk-enriched béchamel and a pile of Parmesan. 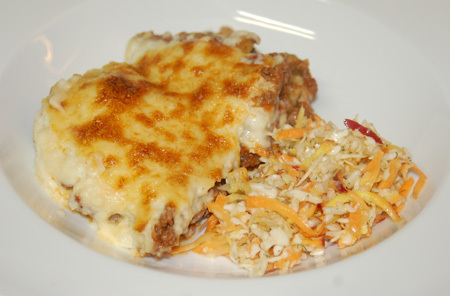 The moussaka emerged from the oven with a heavenly, bubbly golden-brown top. I had been so concentrated on building it that I didn’t give any consideration to accompaniments until after it was in the oven. The standard suggestions of Greek salad and crusty bread weren’t going to work for us, unfortunately, but since a light acidic side dish was highly appropriate for such a rich entrée, I tracked down a Greek salad called lahanosalata, composed simply of shredded cabbage and carrots in a vinaigrette, much like a light coleslaw. I used orange and purple carrots for some visual interest, red wine vinegar in place of lemon juice, and a little dill because I love it. The crisp, cold salad provided just the right touch of brightness to the creamy, meaty moussaka, and I should also note that the eggplant’s flavor melded right into the sauce and was barely even detectable. All in all, this was a delicious, warming meal for a cool evening, and a great way to use my autumn produce. Next time I make it, I will be bold and use even more eggplant—and remember to have a fresh loaf of bread on hand! After salting eggplant, prepare meat sauce. 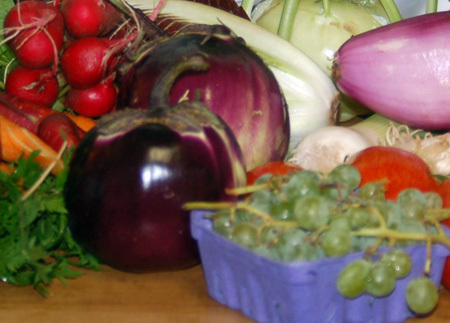 While broiling or pan-frying eggplant, reduce liquid in meat sauce and prepare béchamel. Preheat oven to 350F and lightly oil a 9×13 baking dish. Sprinkle the bottom evenly with bread crumbs. 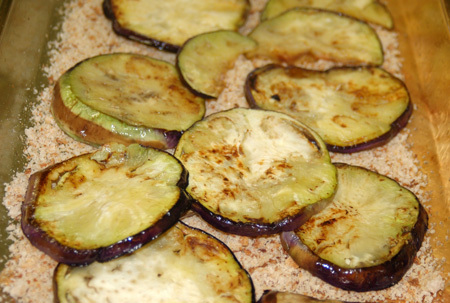 Place a layer of eggplant slices (and potato, if using) on the baking dish; cover with half of meat sauce. Repeat these two layers one more time. Gently pour the béchamel sauce evenly over the dish. Spinkle with grated cheese and bake 45-60 minutes, until béchamel is thick and golden brown on top. Serve warm, with lahanosalata or Greek salad and crusty bread (or, if you are simultaneously channeling the Greek festival and Oktoberfest, try a side of lacto-fermented sauerkraut—much better than it sounds!). In a large heavy Dutch oven, heat 2 T olive oil and sauté onion until translucent. Add meat and brown lightly. Add tomatoes, garlic, and ground and whole spices, plus a little water if it seems dry. Lower heat and simmer, covered, for about 45 minutes, adding additional water if necessary. Stir in tomato paste and wine. Leave cover off and keep at a hard simmer until all liquid has been absorbed. Remove from the heat and cool slightly. Melt the butter in a medium saucepan. Add the flour and whisk periodically for 3-5 minutes, until the raw taste has gone out of the flour. Pour in the milk, and whisk until the mixture thickens. Add salt, pepper and nutmeg. When sufficiently thickened, remove from the heat and allow to cool slightly before whisking in the egg yolks. Source: The Food and Wine of Greece , by Diane Kochilas (pp. 40, 164-165). First time here at your blog. Saw the recipe on Foodbuzz. Great job on the moussaka and it’s your first time! We often add potatoes and courgettes as well in the moussakas and I servecabbage salad often with this dish. It came out beautifully. Beginners luck?